Winter wedding season coming up, y’all. After the dress and the décor, what tops that wedding list is most-likely going to be the cake. Which means it is one of the most important things to consider while wedding planning. Which means there are thousands of brides hunting for the perfect winter cake colour or design to match their fancy winter wedding bash. 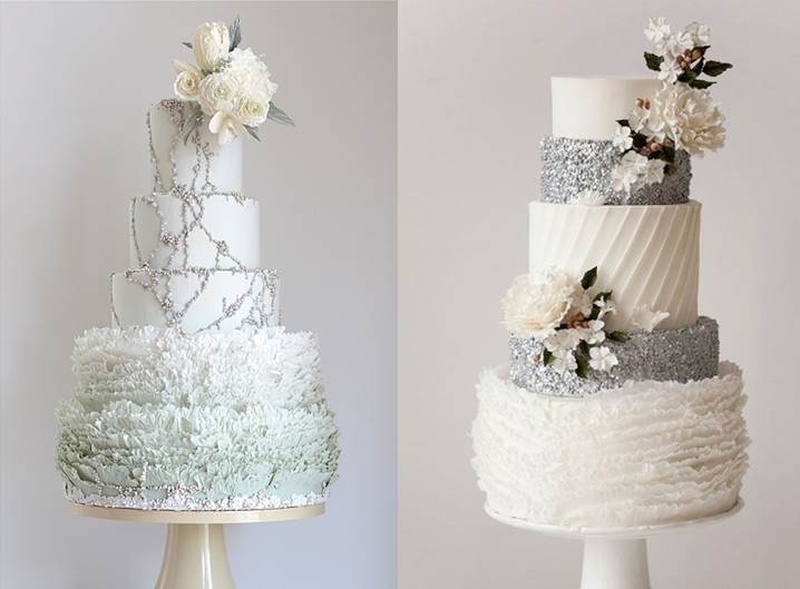 Soo, to help all those already frantic souls with picking out the most beautiful and also the most fitting wedding cake, we’ve made a list of some top winter wonderland wedding cake themes that are to die for. Scroll on for fab inspo! Check out our WinterWeddingSeries for all you need to know on winter weddings! Fashion, colour themes, décor, cocktails and more included. Glitter silver and winter blend together like peanut butter and jelly. The silver adds a nice cool vibe while the glitter adds the glam quotient. This combo certainly spells beautiful in every way. Check out these stunning cakes for visual details. Click here for more silver wedding ideas! With the festive season in, it wouldn’t hurt to add a little holiday spirit at your winter wedding with Christmas inspired cakes! Reds, greens, whites along with pine cones, candy canes and other key festive elements make a lovely set. We may not have much of snow or ice in this country, but they certainly do add a stunningly whimsical touch to anything. Use this with white or crystal winter wedding decor for a beautiful look. For all the bridal princesses out there, this one is the right choice. If you’ve always wanted a fairytale wedding, then pick these cuties for a storybook feel at your big day. What could fit the winter season more?! These sweater/knit patterns add a cute and creative look to your wedding cake theme. These fancy wedding cakes are just beyond glam and gorgeous! They add a contemporary as well as vintage vibe to the theme. Click here for ideas on crystal wedding décor. Again, we agree that snowflakes are never seen here, but doesn’t that give you more of a reason to incorporate them in your winter wedding affair? Just like how no snowflake is the same, your wedding cake is going to be unique as well. Don’t want a big, fancy cake? Go for cute, little assorted cupcakes with different themes! You could even mix up all of the above themes in mini format. For more winter wedding dessert ideas, click here.